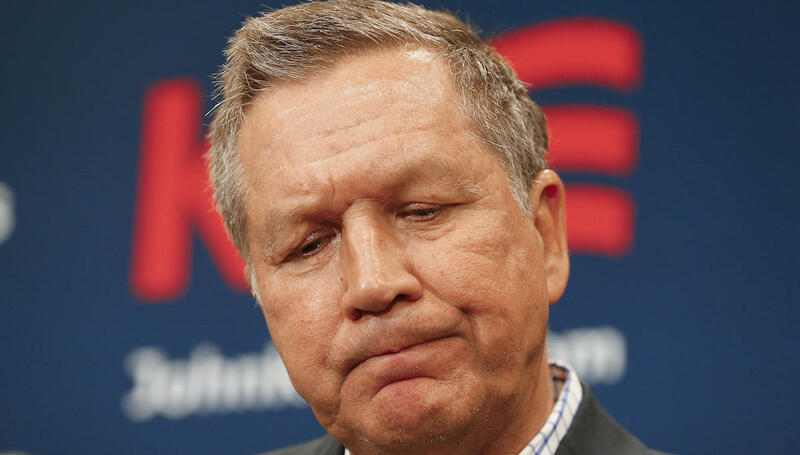 COLUMBUS, Ohio (AP): Ohio Governor John Kasich ends his presidential campaign. Photo: AP. COLUMBUS, Ohio (AP) — The last man standing in Donald Trump’s path to the Republican nomination, Ohio Gov. John Kasich ended his campaign Wednesday, making Trump the party’s presumptive nominee. Speaking to reporters in Columbus, Ohio, Kasich didn’t outline his reasons for ending his bid or mention Trump. Instead, he offered an emotional recount of his exchanges with voters on and renewed his call for Americans to spend more time helping one another. “Nobody has ever done more with less in the history of politics,” he said. “I think John will be very helpful with Ohio, even as governor,” he said. Trump stressed that he’s had a good relationship with the Ohio governor and said he’s willing to consider Kasich as his running mate. “I would be interested in vetting John,” he said. Touting his two terms as governor and 18 years in Congress, Kasich failed to gain traction with GOP voters in a race dominated by Trump’s ability to seize on the electorate’s anger and disdain of political insiders. Although Kasich tried to pitch himself as the best Republican to take on Hillary Clinton, the weight of the anti-Trump faction never got behind him. Viewed widely as a longshot candidate from the start, Kasich’s popularity shot up after his strong second-place finish in New Hampshire’s primary in early February. But from the South to the Midwest, many voters were captivated by his boisterous rivals, and his efforts to cast himself as a nicer alternative fell short. He did eventually launch a series of blistering criticisms against Trump’s candidacy, blasting the businessman for creating a “toxic” environment and preying on people’s fears. “As I suspend my campaign today, I have renewed faith, deeper faith, that the Lord will show me the way forward and fulfill the purpose of my life,” he said.